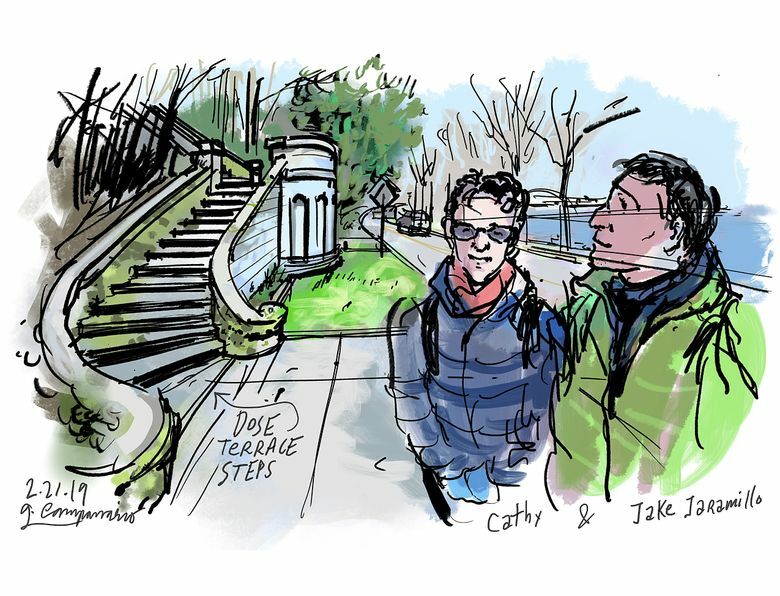 Seattle has more than 650 public stairways and local stairway gurus Cathy and Jake Jaramillo have written a book about them. Want to learn more? Join the Jaramillos on a tour of Magnolia's stairways on March 2. I have driven by this artful stairway entrance off Lake Washington Boulevard a few times, but it wasn’t until local stairway gurus Cathy and Jake Jaramillo told me more about it that I finally climbed its 138 steps. 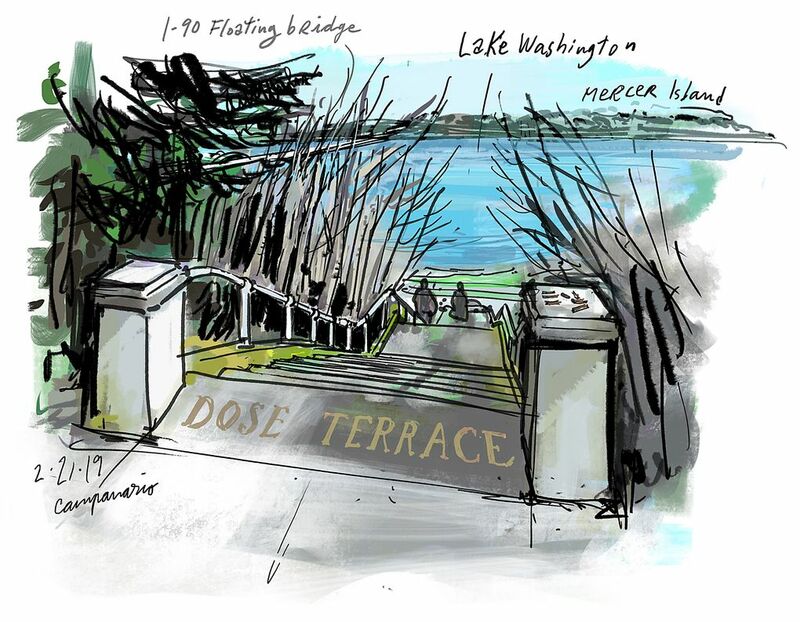 The Dose Terrace stairway, named after Charles P. Dose, the real-estate developer who platted this area in the early 1900s, leads up to 34th Avenue South in the Mount Baker residential neighborhood and a little trail that connects with nearby Colman Park. From the upper entrance, the tree foliage makes it difficult to see the complete stairway during the summer, but impressive winter views through the leafless trees include Lake Washington, the I-90 floating bridges and Mercer Island. The steps are popular with walkers and runners who come here to exercise — those sticks resting on a pillar are used by some to keep track of their climbing laps. Cathy and Jake’s obsession with Seattle’s outdoor stairways started as a weekend hobby when they moved here from Southern California in 2001. A blog and thousands of up-and-down steps led them to author a book of Seattle Stairway Walks where they feature the Dose Terrace steps and many other locations that I’m now eager to explore on my own. Did you know that Seattle has more than 650 public stairways, and nearly 90 of those stairways have more than 100 steps? I can’t think of a better way to find new perspectives and experience the city’s complicated topography, history and neighborhood character. P.S. You can learn more about Seattle stairways from Cathy and Jake at a “Talk & Walk” event hosted by Feet First in Magnolia on March 2.